To describe Jim Wallis as an interesting person would be a big understatement. Wallis is one of the most influential people on the international political circuit and especially in the United States. Wallis is an evangelical Christian and political activist, being one of those rare individuals who is highly respected in both arenas. He currently works as a spiritual advisor to Barack Obama and became good friends with Gordon Brown while he was Chancellor of the Exchequer. He is the vice chair of the Global Agenda Council on Values of the World Economic Forum, regularly attending the annual Davos business summit in Switzerland and mixing with world leaders. He is president and founder of the Sojourners movement and magazine which are committed to campaigning for social justice. The magazine has a readership of more than a quarter of a million. He has also been arrested 22 times for acts of civil disobedience and happens to be married to Joy Carroll upon whom the Vicar of Dibley was partially based. 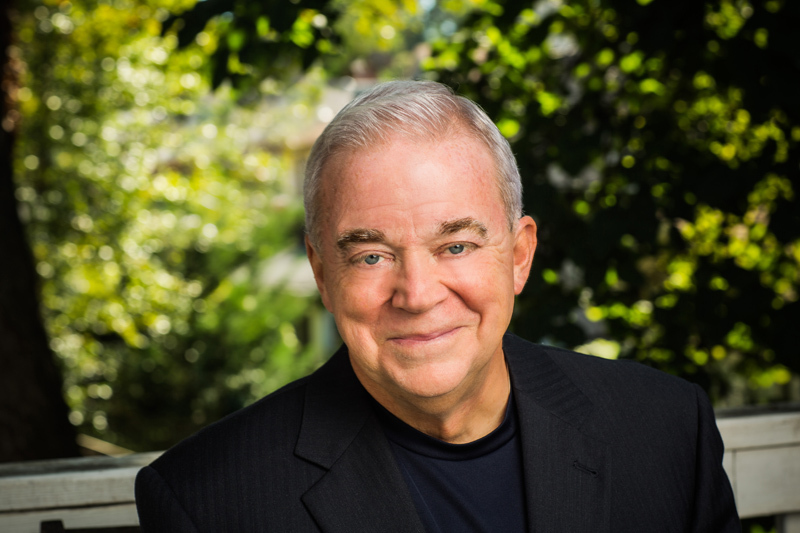 Jim Wallis’ writings and career have influenced me personally too. His book God’s Politics was the inspiration for the name of this blog. Much of my initial intention when I started it was to emulate some of what Wallis and Sojourners are doing and adapt it for the United Kingdom. It was therefore a great pleasure to finally see and hear him in the flesh as he met with a small group of people at the Bible Society’s headquarters on Wednesday evening. 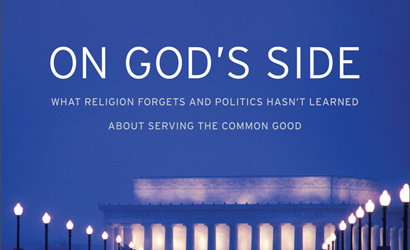 Wallis has been speaking at a number of events including Greenbelt over the last couple of weeks in the UK prompting his new book On God’s Side: What Religion Forgets and Politics Hasn’t Learned About Serving the Common Good. He has used his talks to flesh this statement out. What is the common good? What does it mean for Christians? How can we work towards the common good when it means engaging with those we disagree with? What needs to be done to get politicians to care about the common good, that which is best for all of us? There is a big problem with politics. In Wallis’ eyes it is broken. So often winning elections is more important than governing (especially in the US) and blaming is more common than solving. 50 years ago the Rev. Dr. Martin Luther King, Jr. had good reason to complain about the way black people were being treated, but he didn’t proclaim, “I have a complaint”. Instead he poured out a dream of a better future. What could have been angry and confrontational provided sparks for an ongoing movement and vision where all of us are equal in the eyes of God. So many of our politicians have lost sight of this vision for the common good. If we are to have a healthy and functioning society we need our politicians to grasp this concept and make it a reality. Wallis believes that we can’t expect politicians to conjure this up themselves. Instead the church needs to be the driving force behind this. For Christians the common good should be ingrained in our very being. Jesus calls us to love our neighbours as ourselves. Our relationship with God impacts our relationship with others and this is the spiritual foundation for the common good. Wallis acknowledged that much of what he is talking about on the common good is already well established in Catholic Social Teaching. Our relationship that we enjoy in union with God leads us to allow God to transform us. That spiritual transformation is then acted out in reality as we collectively look to take an internal transformation and apply it to the society around us. This works at a local level and beyond including institutions of government and business. We should be seeking virtuous institutions as well as the virtue of the individual. This desire to see change for the common good is most effective when it takes the form of social movements, when many come together to cause politicians and leaders to act. Wallis gave an example in the US where the churches have been making the politicians rethink their attitude towards immigration. Church growth in recent years has been predominantly down to a huge influx of immigrants. They have gained and understanding and perspective on immigration that few politicians have. 200,000 Christians have been mobilised to read their Bibles and pray daily that laws will not be passed that treat immigrants inhumanely. The government is responding as a result. He also talked about the Jubilee 2000 campaign bringing the subject of debt relief into the political fray in a way that could not be ignored. Wallis had been told by international leaders that if Jubliee 2000 hadn’t made the issue of debt relief popular in the public realm then the billions of dollars of debt cancellation just would not have happened. If we you to see change it might be possible to persuade individual politicians to support your cause according to Wallis, but without serious backing you’re not likely to see it happen. It’s easy for politicians to be sceptical using their cynicism as a buffer against personal commitment. They not only need moral courage to make the big decisions, they also need political cover. If the public is behind a particular issue, it is much easier for politicians to buy into that effectively, in particular across party boundaries in a bipartisan way. One of Wallis’ frustrations is the decline in bipartisan politics with parties increasingly likely to refuse to work across party boundaries (as has happened in the recent vote on Syria) despite the benefits of seeking to achieve a consensus. He also believes that there are areas that politicians are unwilling or unable to lead on such as immigration or the environment. In these cases it requires the church to take a stance and push the issue into the public square. We are seeing some of this with Justin Welby driving an agenda forwards on banking, money lenders and the poor. Wallis also told a story of the Barack Obama going to the church leaders, again on an aspect of immigration legislation, asking for their help because of lack of movement amongst the politicians. Church leaders provided a coordinated response raising the issue publicly. The resultant pressure caused politicians to respond, reaching agreement across party lines. Things are somewhat different in the UK. Wallis agreed during questions that the church has far less muscle here than in the US. The media is less interested in religious opinions. He believes though that the church has a bigger voice than it realises and that it needs to learn to use it and flex its muscles more effectively but not in a forceful way. Wallis’ recipe for building powerful social movements that work towards the common good are prayer and bible study. It’s through these that hearts and minds are changed and action results. It’s time to find a better vision for our life together. Politics is failing to solve most of the biggest problems our world now faces – and the disillusionment with elections and politicians has gone global. Politicians continue to focus on blame instead of solutions, winning instead of governing, ideology instead of civility. As the most expensive election in American history just showed, the financial cheques have replaced all the balances in our public life. But cynicism cannot be our response to failed politics. Instead we must go deeper. Solving the world’s problems requires a commitment to a very ancient idea whose time has urgently come: the common good. How do we work together, even with people we don’t agree with? How do we treat each other, especially the poorest and most vulnerable? How do we take care of not just ourselves but also one another? How do we move beyond the interests of left and right and become accountable to a higher good? Only by inspiring a spiritual and practical commitment to the common good can we make our personal and public lives better. For Christians, the idea of the common good derives from Jesus’ commandment to love our neighbour – including “the least of these” – which is still the most transformational social ethic the world has ever seen. But our faith traditions agree that loving our neighbour is required if we say we love God. Making our treatment of the most vulnerable the moral test of any society’s “righteousness” or integrity is ultimately the best way to make absolutely sure that we are protecting the human life and dignity of all God’s children. Many people feel politically homeless in the raging battles between ideological extremes. But they could find a new home in a new call for the common good – a vision drawn from the heart of our religious traditions that allows us to make our faith public but not narrowly partisan and to join with others of different faiths, or even no faith, who share common moral sensibilities. We need to transcend the power of markets and the reach of governments by holding both them and all of us accountable to the common good. To be on God’s side and not merely claim that God is on ours means to live out the prayer Jesus taught us to pray: “Thy kingdom come, thy will be done on earth as it is in heaven.”… I hope you will join the common good conversation, which I believe could be transformative for us all. Truly impressive man. We need more like him. I was struck by the number of times that he he has stood up for justice and the Kingdom and been arrested (this is never a pleasant experience, and can be quite scary particularly in the USA where the great majority of police are armed. I also welcomed his positive endorsements of Justin Welby and Pope Francis. Yes – thanks for this post, you are a great writer and commentator. It was so interesting to hear Wallis at Greenbelt. As part of that talk he urged us all to learn the art of conflict resolution – encouraging Christians to be peace-makers, not peace-lovers. I guess that the latter may well arrive when the first is in place, but nevertheless an interesting thing to mull over at this time. Perhaps the key thing I took away though was the challenge of what it means to say one believes in God? Following through the consequences of what that means for an individual, for society: how can we sit on the sidelines and wonder where our place is? ‘My concern is not whether God is on our side; my greatest concern is to be on God’s side’. So maybe let’s all devote ourselves to knowing God more and more each day and praying for greater insight into what His side is at all times? Thank you for the kind comments – much appreciated. Great quote and final point too. I’d go along with that. It’s so important to try to listen to what God is saying rather than assuming we already know. Beautiful blog for the Polititians and World leaders. By faith they can be transformed.